The paper does find other electron acceptors than sulfate in anaerobic methane oxidation.
" horizons of potential AOM coupled either to sulfate reduction in a sulfate-methane transition zone (SMTZ) or to the reduction of other electron acceptors, such as iron, manganese or nitrate. " I suspect that we won't get to largescale Canfield conditions. And as noted many times upthread, subsequent expeditions found that the estimated releases from S&S were way too high. The Laptev and East Siberian Seas have been proposed as a substantial source of methane (CH4) to the atmosphere. During summer 2014, we made unique high-resolution simultaneous measurements of CH4 in the atmosphere above, and surface waters of, the Laptev and East Siberian Seas. Turbulence-driven sea-air fluxes along the ship’s track were derived from these observations; an average diffusive flux of 2.99mgm2 d1 was calculated for the Laptev Sea and for the ice-free portions of the western East Siberian Sea, 3.80mgm2 d1. Although seafloor bubble plumes were observed at two locations in the study area, our calculate ions suggest that regionally, turbulence-driven diffusive flux alone accounts for the observed atmospheric CH4 enhancements, with only a local, limited role for bubble fluxes, in contrast to earlier reports. CH4 in subice seawater in certain areas suggests that a short-lived flux also occurs annually at ice-out. assumed a very shallow 200m mixing height (very low inversions were observed during SWERUS-C3) [Tjernström et al., 2015], a 35m water column, and an 80 ppb atmospheric CH4 enhancement, raising atmospheric CH4 from apparent background levels of about 1.87 ppm to 1.95 ppm. This requires a sustained CH4 flux of about ~12mgm2 d1, similar to the fluxes we observed during SWERUS in areas near subsea gas seeps on the ESAS (Table 2). An average flux near ESAS subsea seeps of 13mgm2 d1 was reported previously [Sergienko et al., 2012]. Sustaining higher atmospheric CH4 concentrations is even more difficult: to sustain 2.1ppm CH4 in the atmosphere (35m water column, 200m mixing height) would require a flux similar to a subarctic wetland (~36mgm2 d1) [Bartlett and Harriss, 1993] or an order of magnitude above the average fluxes we observed in the ice-free ESAS. Abstract—Data on the vertical distribution of gaseous and aerosol composition of air, measured onboard the Tu-134 Optic airborne laboratory in October 2014 over the Kara Sea and coastal areas of the Russian Arctic, are presented. We revealed the specific features of the altitude distributions of CO2 and aerosol over the Kara Sea as compared to continental conditions. No significant deviations from continental distributions are found for CH4, CO, and O3. pool, and a potentially large source of methane to the atmosphere. S&S took their measurements at methane seeps during the summer and then estimated what the entire ESAS methane release would be annually. Subsequent studies have shown that those estimates for the entire ESAS are too high. I'm not denying anything. I'm telling you what the peer-reviewed science says. You're the one who's denying it. And your only willing to look at one side of the picture. There is no consensus that the Arctic methane isn’t a threat. There are papers that conclude what your saying, and there are papers that conclude what I’m saying. My only worry is we all conclude it’s a not a problem or a problem for the grandchildren then we lose the opportunity to do something about it if it is a threat. There is no time for hope, or wishful thinking. We need to do something now. The very existence of our species is on the line. and pay special note to Dr Hansen's comments above. I think it puts the matter clearly and into perspective for now and the possible futures still up for grabs. Major Arctic CH4 "feedback releases" is still part of future possibilities ... it all depends if man made ghg emissions are stopped or not stopped. We’re not getting off that easy. We have to turn and fight for the future. S&S took their measurements at methane seeps during the summer and then estimated what the entire ESAS methane release would be annually. I am far from convinced by that claim. Can you prove it? That S&S have outright "cherry-picked" summer only emissions, taken over a couple of weeks and then simply extrapolated that "data" to apply across the entire ESAS for 365 days a year. I don't believe it. You'll have to show me precisely where they did it and hopefully explain how they managed to get that past "peer review" in multiple papers they have published. You might also want to make sure that the papers and claims you're relying upon haven't done something like what you are publicly accusing S&S of doing .... which btw amounts to being "fraud" by misrepresenting their own data. I didn't accuse them of cherry-picking data. They may have made some assumptions that other scientists don't agree with. There's a huge difference. boundary layer5 over the water. the bubble-induced CH4 flux from shallow ESAS hotspots. (considering areas of fault zones in the ESAS, Supplementary Fig. of total ESASCH4 emissions to atmosphere to 17 Tg yr 1. Other scientists disagree with their estimate of 17 Tg/year. Most put it a 2 to 4 Tg per year as I've already documented upthread. I would like to weigh in and thank you for this discussion on methane. From reading the comments, I would conclude that the risk associated with methane release is not quantified as there are still uncertainties as to how much and how fast methane will be released. I want to believe that even the lowest estimates are too large as this issue frightens me but my biggest concern is regardless of the science on methane, we are heading towards catastrophic climate change due to our persistent BAU behavior. Please continue this discussion with research links. You'll note that Dr. Hanson and the other scientists in the video are basically stating what I've been saying in this thread, there is no threat of a "methane time bomb" if we can get off of fossil fuels in the next few decades and that we can avoid the massive methane release from the Arctic permafrost. It's not something to lose sleep over. I'll point posters to the Policy and Solutions forums on this site where we're showing that renewables, EVs, batteries and other solutions make it possible for the transition that's needed. catastrophic levels of methane in the near-term (Ruppel and Kessler, 2017). layer has thinned enough to risk destabilising hydrates (The Arctic, 2017). debate the strength of analyses of our near-term extinction." Natural methane emissions are noticeably influenced by warming of cold arctic ecosystems and permafrost. An evaluation specifically of Arctic natural methane emissions in relation to our ability to mitigate anthropogenic methane emissions is needed. Here we use empirical scenarios of increases in natural emissions together with maximum technically feasible reductions in anthropogenic emissions to evaluate their potential influence on future atmospheric methane concentrations and associated radiative forcing (RF). The largest amplification of natural emissions yields up to 42% higher atmospheric methane concentrations by the year 2100 compared with no change in natural emissions. The most likely scenarios are lower than this, while anthropogenic emission reductions may have a much greater yielding effect, with the potential of halving atmospheric methane concentrations by 2100 compared to when anthropogenic emissions continue to increase as in a business-as-usual case. In a broader perspective, it is shown that man-made emissions can be reduced sufficiently to limit methane-caused climate warming by 2100 even in the case of an uncontrolled natural Arctic methane emission feedback, but this requires a committed, global effort towards maximum feasible reductions. Sorry guys I'm not sold! Since the flip flop in 2014 ( that saw the Pacific naturals flip and Antarctic sea ice levels begin to drop to late 1970's levels) global temps have begun to again surge ( I know , we need 'more time' to safely claim that.....but we don't have the time!) Mother N. has been making up for any reductions in GHG's we have managed to achieve. We've been told its Nino, its northern soils outgassing, its methane from meltwater lakes across permafrost regions but what it really is is a warning that we have run into the time where feedbacks will increasingly challenge our attempts to reduce the GHG burden? There is a new paper out looking at the impacts of mid lat volcanic eruptions. It shows that we massively underestimated the 'cooling' the Sulphate 'dimming' causes around that hemisphere. China and its mid Lat Sulphate 'dimming' (through the late 90's/noughties) and its 'drop off' alongside the flip , or forcing the flip, in the Pacific naturals in 2014 leading that , in its turn, causes the current surge in Global temps may well prove to be the 'push' that sets off a positive feedback over the northern soils/permafrost seeing naturals keep global CO2 yearly increases will into the B.A.U. figures no matter human reduction in output? To me it makes more sense to live in this world of B.A.U. outputs and not entertain some make believe world of us 'acting globally' to rapidly reduce GHG forcing over the coming decade? After I read Ken's last comment which quoted accurately the research conclusions, I felt a compelling urge to respond but then read the followup comments here and realized there was no need. Yes, IF we drastically reduce anthropogenic emissions, we can avoid all sorts of devastating feedbacks. But we are doing nothing of the sort. My mother-in-law had a slightly different version of this when someone would begin a statement with "If..."
"If my Aunt had balls, she'd be my Uncle." I hold onto one tiny sliver of hope and it has to do with addressing the system issues that are driving us to the brink. The system is the growth system of world capitalism. So long as there is money to be made exploiting our environment, irregardless of the fact that this continued exploitation will kill us all, there will be individuals and corporations willing to do the work needed to make that money. When we look at evil corporations that are engaging in (fracking oil, industrial agriculture, etc.) we treat these activities as something separate from ourselves, refusing to see the roles we play in this system as consumers. Yet it is consumer demand that creates the economic environment that makes such activities profitable. We need a paradigm shift, recognize our role in propping up a system that is killing us and then individually choose to turn our backs on the system. The really neat thing is that this paradigm shift can occur in an instant for any of us and the impact of that shift can be instantaneous. A Little Secret: Such a paradigm shift, while absolutely essential to be adopted by residents of the consumer nations, will drive tremendous change in the behavior of the system. This can be a scary thought. What comes next? I overcome this fear with the clear understanding that this rapid change, driven by a paradigm shift will be far more manageable then the unplanned collapse that is hurtling towards us. May I humbly suggest you are totally missing the point, again? I'll try and explain it in simpler terms. I am not losing sleep over a methane bomb in the near future. Neither is whereistheice and others from what I can tell. whereistheice, others and I ALSO agree with Hansen and I suspect (?) with the comments and conclusions of Dr. Ruppel as well. But when you have VARIATIONS in "scientific" estimates between 2Tg and 17Tg it tells us something more important than the actual numbers do - DISAGREEMENTS ABOUNDS ON ESTIMATES .... all of them could be wrong because frankly not enough hard data is actually available in order for SCIENTISTS (not forum folks) to agree with. Compare that with say MLO CO2 readings where the consensus ppint is 99.9% of all scientists agree the readings are reliable as are Global readings "estimates" and the direct co-relationship between PPMV and actual manmade emissions + natural emissions that are "spiking" in different regions at different times for different reasons ... which my dear friend are INCREASING not decreasing. So sure alt energy sources are known and minor deployments are being made while simultaneously GHG emissions are INCREASING still. Therefore it is abundantly clear to almost all that an ASSUMPTION that "there is no threat of a "methane time bomb" if we can get off of fossil fuels in the next few decades" is FALSIFIABLE and that "other solutions make it possible for the transition that's needed" does NOT make it so in the real world in which we live. So it is one thing thing to posit that in your humble opinion there won't be some kind of a sudden Methane Bomb erupting anytime in the next 10-20-30 years (in our lifetime) is "reasonable" given the LACK OF HARD DATA at this point .. it is ILLOGICAL and UNFOUNDED BS to then assume "that we can avoid the massive methane release from the Arctic permafrost" in the middle of or toward the end of the century. And that real genuine solutions for Climate change actually requires STABILIZATION that does not only apply in OUR LIFETIMES but for GENERATIONS AHEAD as well. And so what Hansen, and I and whereistheice and many others like S&S and many other SCIENTISTS are saying in their papers is that future massive methane release from the Arctic permafrost is almost GUARANTEED at some point if we keep following BAU. BAU includes the current uptake of Renewable energy and BAU includes the ongoing INCREASES in GHG in the atmosphere that WILL continue to heat the planet. Therefore NOTHING HAS BEEN SOLVED here .... nothing at all while CO2 continues to break new all time records and 2018 comes in agai8n in the top 4 highest global temps on record. Every scientifically AGREED Data point right now plus current BAU out 20 years is telling us that a future massive methane release from the Arctic permafrost is almost GUARANTEED this century! Excuse CAPS but it's really frustrating trying to break thru such barriers. Total Global human caused GHG emissions must be cut by 80% before Atmospheric CO2 levels even begin to stabilize. We are no where near that point we are still doing the opposite. Recent CO2 is growing at +3 ppm and there is no El Nino happening!!!! Once CO2 levels stabilize (if, when, maybe) WARMING still continues for DECADES ..... it continues to destabilize the Arctic methane and methane stores all over the world and every other potential Positive Feedback mechanism already known. People need to stop pretending everything is FINE and everything will be fixed with renewable energy uptake etc. It's a FALLACY ...it's deeply flawed thinking. We are no where near that point of massive energy use changes yet. Without another single molecule of CH4 escaping from the Arctic the Planet is still TOAST on BAU activity and projections and even on best case scenarios. Therefore every single CH4 molecule can only make it worse. Arctic Permafrost emissions are a concern, are real, and are GUARANTEED to increase in our warming world. GUARANTEED to increase, not maybe not possibly not perhaps, but Guaranteed to add to the warming. It's not nothing. Current "estimates" are irrelevant to this simple LOGIC. PS re quote from above: "We’re not getting off that easy. We have to turn and fight for the future." We haven't even started to turn around let alone FIGHT! I've just taken Lurk off "Ignore", given what you quoted. I've seen there is still some misunderstanding about the lifetime of CO2 in the atmosphere. Global warming is forever, some of the world's top climate scientists have concluded. Their research shows that carbon dioxide emitted from today's homes, cars and factories will continue to heat up the planet for hundreds of thousands of years. It comes as a shock because most governments, and even many scientists, have assumed that carbon dioxide emissions would work their way out of the atmosphere in about a century, enabling it to clean itself fairly rapidly once the world switched to clean sources of energy. But one of the main researchers – Professor David Archer of Chicago University – warns that "the climatic impacts of releasing fossil fuel carbon dioxide into the atmosphere will last longer than Stonehenge, longer than time capsules, far longer than the age of human civilisation so far. Ultimate recovery takes place on timescales of hundreds of thousands of years, a geologic longevity typically associated in public perceptions with nuclear waste." Carbon dioxide mainly leaves the atmosphere by being soaked up by the oceans, but Professor Archer says that "the pervasive notion in the climate science community and in the public at large" that this happens relatively quickly is no longer valid. He and other leading scientists spell out why in a paper to be published in the journal Annual Reviews of Earth and Planetary Sciences. "The ocean is getting fed up with absorbing our CO2," he says. The surface waters, about 100 metres deep, which used to sop up the gas quite fast, are now getting saturated with it – turning acid in the process – and so decreasing their uptake. They need to be replaced with fresh water from deep down, but this overturning circulation "takes centuries or a millennium". And global warming is expected to slow this down: the hotter the surface layer becomes, the longer the replenishment takes. Indeed, the forthcoming paper will add, research shows that even this renewing process will not be enough to remove all the vast amounts of carbon dioxide that humanity is now adding to the atmosphere. Much of it will have to wait hundreds of thousands of years before being removed by another, infinitely slower, process: the natural weathering of rocks, which incorporates the gas into other substances. And the more pollution that is emitted now, the worse this will become. The models presented here give a broadly coherent picture of the fate of fossil fuel CO2 released into the atmosphere. Equilibration with the ocean will absorb most of it on a timescale of 2 to 20 centuries. Even if this equilibration were allowed to run to completion, a substantial fraction of the CO2, 20–40%, would remain in the atmosphere awaiting slower chemical reactions with CaCO3 and igneous rocks. The remaining CO2 is abundant enough to continue to have a substantial impact on climate for thousands of years. The changes in climate amplify themselves somewhat by driving CO2 out of the warmer ocean. The CO2 invasion has acidified the ocean, the pH of which is largely restored by excess dissolution of CaCO3 from the sea floor and on land and, ultimately, by silicate weathering on land. The recovery of ocean pH restores the ocean’s buffer capacity to absorb CO2, tending to pull CO2 toward lower concentrations over the next 10,000 years. The land biosphere has its greatest impact within the first few centuries, which is when CO2 peaks. Nowhere in these model results or in the published literature is there any reason to conclude that the effects of CO2 release will be substantially confined to just a few centuries. In contrast, generally accepted modern understanding of the global carbon cycle indicates that climate effects of CO2 releases to the atmosphere will persist for tens, if not hundreds, of thousands of years into the future. Heating from greenhouse gases does not go back down within human timescales. The only direction within human timescales is UP. They quote Professor David Archer of Chicago University. I am not questioning the article but there is no such university in Chicago. There is a Chicago State University and a University of Chicago? They meant University of Chicago. Cid_Yama, thanks for this sad reminder. SH, attention to small details is a thankless job... but thanks too. Hardly worked up about it. What in my comment seemed to suggest this was the case? Extract: "With the next assessment report (AR6) not due until 2022, it is timely to consider how evidence presented since the publication of AR5 affects the assessments made then. In summary, gradual climate change could trigger abrupt changes – with large regional and potentially global impacts – associated with thresholds in the Earth system. The possibility of crossing any of these thresholds increases with each increment of warming." Title: "The 17th-century philosopher whose scientific ideas could tackle climate change today"
An easier way (for me at least) to pull all those threads together is the notion that: You do not solve paradigm crises by the same kind of thinking that got you into them and which (obviously) continue to sustain them. When I say "change the system" I don't mean make adjustments I mean dump it for a completely new system from the ground up ... iow a new Paradigm of Thinking and Acting and Values. The one we have is broken and no longer fit for purpose. IMHO these matters also manifest in all kinds of ways including the two and fros here about is Arctic Methane Release a concern worth being concerned about - and who's science papers are the best ones to rely upon and which consensus is the "real" consensus - all these erupt from foundational thinking, memes, beliefs, paradigms etc. It's been proven by Cog science and linguistics (see Chomsky Lakoff etc) that our ways of talking and thinking are inseparably one unit. The talk will not change until the thinking changes first. Nor will the Voting which is also "speech". Agreed. Money is also speech. The new findings challenge a long-standing paradigm that ocean water alone regulated carbon dioxide in the atmosphere during glacial cycles. Instead, the study shows geologic processes can dramatically upset the carbon cycle and cause global change. The scientists report evidence of deep-sea hydrothermal systems releasing greenhouse gases to the ocean and atmosphere at the end of the last ice age, just as the oceans were beginning to warm. ... the new data show that there were major releases of naturally occurring carbon from the EEP, which contributed to dramatic change in Earth's temperature as the ice age was ending, the study says. If undersea carbon reservoirs are upset again, they would emit a huge new source of greenhouse gases, exacerbating climate change. Temperature increases in the ocean are on pace to reach that tipping point by the end of the century. For example, a big carbon reservoir beneath the western Pacific near Taiwan is already within a few degrees Celsius of destabilizing. Similar discoveries of carbon gas reservoirs have been made off the coast of Okinawa, in the Aegean Sea, in the Gulf of California and off the west coast of Canada. At issue are expanses of carbon dioxide and methane accumulating underwater and scattered across the seafloor. They form as volcanic activity releases heat and gases that can congeal into liquid and solid hydrates ... These undersea carbon reservoirs largely stay put unless perturbed, but the new study shows the natural reservoirs are vulnerable in a warming ocean and provides proof the Earth's climate has been affected by rapid release of geologic carbon. ... The federal government's Climate Science Special Report projected a global increase in average sea surface temperatures of up to 5 degrees Fahrenheit by the end of the century, given current emissions rates. Temperature gains of that magnitude throughout the ocean could eventually destabilize the geologic hydrate reservoirs. Open Access: Lowell Douglas Stott et al. Hydrothermal carbon release to the ocean and atmosphere from the Eastern Equatorial Pacific during the Last Glacial Termination, Environmental Research Letters (2019). ... a significant release of hydrothermal fluids entered the ocean at the last glacial termination. The large 14C anomaly was accompanied by a ~4-fold increase in Zn/Ca in both benthic and planktic foraminfera that reflects an increase in dissolved [Zn] throughout the water column. Foraminiferal B/Ca and Li/Ca results from these sites document deglacial declines in [CO32-] throughout the water column; these were accompanied by carbonate dissolution at water depths that today lie well above the calcite lysocline. Taken together, these results are strong evidence for an increased flux of hydrothermally-derived CO2 through the EEP upwelling system at the last glacial termination that would have exchanged with the atmosphere and affected both Δ14C and pCO2. Open Access: Lowell Douglas Stott et al. 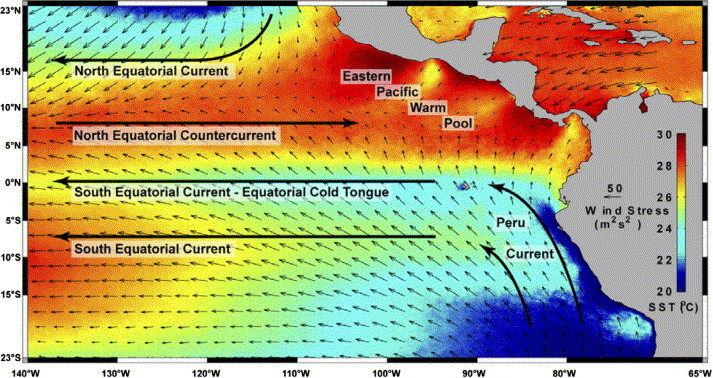 Hydrothermal carbon release to the ocean and atmosphere from the Eastern Equatorial Pacific during the Last Glacial Termination[/b]]Hydrothermal carbon release to the ocean and atmosphere from the Eastern Equatorial Pacific during the Last Glacial Termination, Environmental Research Letters (2019). Great find thanks for sharing! anthropogenic releases to the atmosphere. feedback (Mestdagh et al., 2017). The details in this ground research study are informative. As have some of S&S studies in river beds and the shelf shown very large disparities in CH4 content/emissions and complex behaviours and geologic formations. This paper certainly addresses the complexities of this kind of research and how easily incorrect assumptions/conclusions can be drawn. iow there are multiple forms of methane in how it is formed to start with, set in multiple different geological land formations, that produces multiple kinds of releases and rates of release and is therefore susceptible to the type and duration of scientific monitoring being done. How correct are they I am unsure but their presentation is first class and more understandable than many other papers. It's also real world in the field vs theoretical assumptions in models. Boreholes represent a very specific kind of permafrost disturbance, which has a very narrow conduit leading methane directly to the atmosphere, and is rare in natural types of disturbance. Natural conduits like faults usually are initially associated with depressions, which fill with water in the permafrost zone. Much of the gas passing through this environment must have dissolved, dissipated, become buried, or been microbially transformed, and thus did not reach the surface. Only young features related to gas emission such as boreholes, or gas explosion craters emit methane at the high rates that we observed. However, such types of emission are short-term. In our case, the emission did not exceed 10 days; for deeper boreholes, it may last for months. The Yamal crater emitted methane no longer than several months, because no signs of ebullition were detected on its surface when it was examined . Features in permafrost zone that emit large amounts of gas usually do not do so at a time scale of years. Given the surface origin of methane in the gas shows, which occured both in gas-bearing West Siberia and non-gas-bearing Kolyma Lowland deposits, we should agree with the published research  that in cold continuous permafrost, the methane accumulations are preserved better than in areas that experienced glaciations. It is likely that in the latter regions, methane can emit through the permeable sediments to the air, contributing to the surficial fluxes. In both regions, we see that gas accumulations are mainly surface features, but in some cases, the geological origin is common. It was pointed out in our previous studies that methane accumulates in epigenetic permafrost, which was formed by the freezing of sediments that already passed the diagenetic stage  and were originally saturated with gas. The concentration of methane in such deposits is higher than in syngenetic deposits, which lack methane in most cases . The epicryogenic freezing of methane-rich soils was considered to be the main mechanism of the gas dislocation and the formation of methane accumulations in permafrost . The findings of excessive storages of methane that were reported here, which could be released from the boreholes, further supports the opinion that the history of permafrost formation should be taken into account in order to find the accumulations of methane in either form. The gas shows from boreholes in epigenetic permafrost could be a strong source of methane, especially right after drilling. Based on the measured concentration in boreholes, we estimated flux through the borehole mouth from a 25-m deep borehole ranging from 1.6 g CH4 day−1 m−2 to 0.8 × 106 g CH4 day−1 m−2. Such fluxes occur both in oil and gas-bearing regions and outside of them. The fluxes diminish to near-zero values within several days, so we do not find it appropriate to extrapolate the effect of any gas show to an annual timescale. Not all of them could be called seeps. The emission of methane from boreholes could not be attributed only to the disturbing effect of drilling on permafrost. The volumes and dynamics of gas emission from boreholes point to the occurrence of traps filled with methane in permafrost. There are no visual features pointing to the existence of the trap in sediments. Both the surficial biogenic methane transported during freezing, and the diffusion/filtration of methane from deep-Earth sources via a system of conduits and traps represented by porous deposits unconstrained with ice can be associated with methane accumulation. The application of indicators such as the equivalent diameter of degassing provides an estimate of the size and, if monitored during drilling, might help to find the location of the source of methane in the borehole. The concentration of methane in permafrost samples also seems to be a good indicator of the occurrence of gas shows in boreholes. CH4 entrapped in permafrost could constitute some contributions to the fluxes of greenhouse gases in permeable permafrost. The disturbance of permafrost provides a path for the liberation of gas from the traps. The occurrence of lithological traps in permafrost is not ubiquitous, and could be studied using subsurface sounding, studies of permafrost evolution, gas amounts, and gas composition. PS "annual estimates may be too high" and "could be mistakes" applies to every paper on every AGW aspect I have ever read. It comes with the territory. They all say that somewhere sometime. It's how scientists and researchers speak. In the meantime despite "science" being based on the notion that what a scientist does in a paper needs to be "replicable" so that others can repeat the "experiment" when it comes to AGW/CC issues this never or rarely (hens teeth version of rarely) happens. I have not seen any group actually go and replicate verbatim a S7S research study in the field. Have you? AS in the same place in the same time of year using the exact same MO for measurements and the math used to estimate long-term regional wide emissions? and then found errors and corrected those assumed errors and made a different estimate for the future or region concerned and then compared the two results side by side and explained them clearly. I did see Archer use a totally different MO to claim that S&S estimates were "may be" wrong. But he did not replicate what they did instead using a totally different MO by using long-term Modelling to get a different result. Well why wouldn't he get a different result when they were doing two different thing entirely - like mixing water and oil? I have no issue in these different outputs, it's just the way it is. It's actually impossible to replicate other studies all the time, there isn't the funding the time or the capacity to do so. I tend though to pay special attention to those groups who replicate their own studies years later. That's what I see as "apples to apples" comparisons worth heeding. Because even if there some errors poor assumptions a fair comparison can still be made. Like happens with MLO CO2 readings over time - same MO for decades. Anyway whoever is more right or more wrong doesn't matter in the least in the big picture anyway. I'm content knowing that whatever is known today more will be known tomorrow. And reality trumps every science paper ever written. I take it all with a grain of salt - including the IPCC "summaries"
The need to determine the factors behind the recent rise in methane is urgent: indeed, essential if global warming is to be limited within the Paris Agreement limits. If the main causes are increased anthropogenic emissions, they need to be reduced. If the increased methane burden is driven by increased emissions from natural sources, and if this is a climate feedback –the warming feeding the warming -then there is urgency to reduce anthropogenic emissions, which we can control. If, however, the increase in the methane burden is driven by a decline in the oxidative capacity of the atmosphere, and this is a climate feedback, then the implications are serious indeed. Reducing methane emissions is feasible, especially from fossil fuel sources,and would have rapid impact on the global methane burden. This permits optimism but not complacency: the challenge is large. But there is no single silver bullet: there are many frontiers in methane research, and successfully meeting the Paris goals demands wide-ranging progress. Unless these questions are addressed, and much more attention paid to reducing methane emissions, especially from fossil fuels and biomass burning, the success of the Paris Agreement may be at risk. The strong growth they found just confirms what we have seen in recent years. The causes of the rise are not fully understood, and may include increased emissions and perhaps a decline in the destruction of methane in the air. I bet many here would love to know how much of the factors above contribute. The bigger the last factor is the bigger the trouble is. I don´t think there is much to discuss since we would just be guessing. We need better data, especially on that last factor. in the other, the gas is emanating from tropical wetlands flooded by heavy rains in recent years. Haven´t read to much about that subject but i am wondering how big that contribution could be. How much more wetlands have been flooded since 2005? And the historical trend is us knocking out ever more nature probably including those wetlands. I'm surprised at the lack of interest/comments about this Paper. I though that Paper was really thorough, detailed, easy to read (despite being long) and raised some fairly serious (potential ?) issues about methane. I agree it's a good and well-written paper. I don't have much to add so I usually don't post much in this thread, but I find your summaries here quite useful and to the point. Bottom line, don't judge the level of interest by the lack of comments, I think that it's a case of silent majority. A good explanation of the recent rise in methane concentrations (which are still below the annual increases that happened in the 1980s to early 1990s) is increased fossil fuel emissions. The huge increase in fracking oil and natural gas in the US is a probable source. Also, the growth in agricultural emissions has continued unabated. Methane emissions from the U.S. oil and natural gas supply chain were estimated using ground-based, facility-scale measurements and validated with aircraft observations in areas accounting for ~30% of U.S. gas production. When scaled up nationally, our facility-based estimate of 2015 supply chain emissions is 13 ± 2 Tg/y, equivalent to 2.3% of gross U.S. gas production. This value is ~60% higher than the U.S. EPA inventory estimate, likely because existing inventory methods miss emissions released during abnormal operating conditions. Methane emissions of this magnitude, per unit of natural gas consumed, produce radiative forcing over a 20-year time horizon comparable to the CO2 from natural gas combustion. Significant emission reductions are feasible through rapid detection of the root causes of high emissions and deployment of less failure-prone systems. We used site-level methane (CH4) emissions data from over 1000 natural gas (NG) production sites in eight basins, including 92 new site-level CH4 measurements in the Uinta, northeastern Marcellus, and Denver-Julesburg basins, to investigate CH4 emissions characteristics and develop a new national CH4 emission estimate for the NG production sector. The distribution of site-level emissions is highly skewed, with the top 5% of sites accounting for 50% of cumulative emissions. High emitting sites are predominantly also high producing (>10 Mcfd). However, low NG production sites emit a larger fraction of their CH4 production. When combined with activity data, we predict that this creates substantial variability in the basin-level CH4 emissions which, as a fraction of basin-level CH4 production, range from 0.90% for the Appalachian and Greater Green River to >4.5% in the San Juan and San Joaquin. This suggests that much of the basin-level differences in production-normalized CH4 emissions reported by aircraft studies can be explained by differences in site size and distribution of site-level production rates. We estimate that NG production sites emit total CH4 emissions of 830 Mg/h (95% CI: 530–1200), 63% of which come from the sites producing <100 Mcfd that account for only 10% of total NG production. Our total CH4 emissions estimate is 2.3 times higher than the U.S. Environmental Protection Agency’s estimate and likely attributable to the disproportionate influence of high emitting sites. Both studies indicate that methane emissions from oil and natural gas production exceed US EPA estimates by 2.5 to 5 times. And the scale of leakage is 2 to 4 Tg per year, or about what the natural emissions from the ESAS are annually. That's just in the US. The potential emissions reductions worldwide could stabilize methane levels in the atmosphere as was the case in the late 1990s. But this is only part of the story. For the past 15 years, the United States in particular has put a massive capacity of new gas plants online, many of which are combined-cycle designs. These plants use fuel more efficiently than “peaker” plants, but also ramp more slowly, and as such are often meant for “mid-merit” applications. However, according to a panel at Bloomberg New Energy Finance’s (BNEF) Future of Energy Summit in New York City, the market for new combined cycle gas plants may be coming to a close, in favor of solar and wind paired with energy storage. And this may foreshadow a larger move away from gas. And this is coming from a company that supplies gas plants. Cavada’s statement represents something of a European perspective. The capacity of new gas plants put online in the United States increased from 2016 to 2017, and while pv magazine was not able to find a breakdown by type of plant for the past two years, the majority of deployments have traditionally been combined cycle. However, in California regulators are repeatedly choosing renewable energy plus storage over not only new gas plants, but even continued operation of gas- and oil-fired power plants, including not only combined cycle, but also single-cycle “peaker” plants. Additionally, the bids for clean energy are often coming in at lower prices than other options. Not even close to what I said! You seem to deliberately misinterpret what I've been saying. I've posted many scientific papers to rebut the doomsday scenarios you keep posting from newspapers and other non-scientific sources. I haven't silenced you, yet you keep twisting my words in response. It will take a lot of effort to shift from fossil fuels to carbon free sources. It can be done. Giving up and saying we're all doomed because natural emissions are going to increase is a typical denier tactic. From southern California to Arizona, energy storage units are popping up to make renewables more available when power demand peaks. Electric batteries linked to renewables can be cheaper than conventional natural gas burning peaker generators, the workhorses of the utility sector in periods of high power demand. Utilities are scrambling to deploy batteries at a fast clip as a result, reports the Wall Street Journal. Tucson Electric Power is building a 100-megawatt solar installation backed up with 30-megawatt capacity energy storage facility. Meanwhile, Fluence Energy, a joint venture of Siemens and AES, is building the largest lithium ion battery in the world that will provide backup power to 60,000 southern California homes, the Journal reported. That battery is triple the size of a mammoth energy storage installation Tesla recently built in Australia. This trend of changing out energy generation infrastructure in favor of green, climate-change fighting sources of renewable energy is accelerating. And when the cost of building new renewables plus battery storage is cheaper than operating fossil fuel plants, you'll see those plants close. We hit that point the USA last year too. A new global analysis of 6,685 coal plants finds that it is now cheaper to build new renewable generation than to run 35 percent of coal plants worldwide. By 2030, that percentage increases dramatically, with renewables beating out 96 percent of today’s existing and planned coal-fired generation. The 4 percent exception is in markets with extremely low fuel costs, where coal is cheap and plentiful, or with uncertain policies for renewables, like Russia. The EIA is notorious for underestimating the growth of renewable energy. The EIA reports are not reliable for estimates of future energy generation. Ken, I hope that you are right about renewables taking over, and there is good reason to believe it will happen. But it's a question of pace. For now the trends show continued rise in global fossil fueled electricity, despite the high growth of renewables. Until the trend shifts substantially we cannot assume all will be well. And of course even then there's all the other anthropogenic emission sources which are on much less optimistic trajectories. Not to mention natural feedbacks which will surely grow in time, even if not to doomsday levels. So I am quite pessimistic all in all. This will be my last time posting on this thread, as well as ASIF. The real reason I come to ASIF is for info on the ice. Point is, many posters here lack either urgency or understanding of the entire situation we find ourselves in. I would like to point out I mean no ill will towards people i disagree with. So thanks for all the contributions everywhere. This is a good forum, filled with many good people. Ken Feldman, thank you for that series of posts. They give me hope, however feeble. I agree with you that the transition can be done much faster than anyone thinks. Things are looking good from the technological and financial point of view. The technology to replace fossil fuels exists and it will make our lives better. But it is by no means a sure thing yet. The seeds have been sown. They are sprouting beautifully. But there is a long way to go before the fruit. Lots of work by lots of great people needs to be done to be safe from climate change. There isn't enough sense of urgency yet. Climate change is a problem for us, today, not in the future. Totally understandable. At least take a break and nurture yourself some. Being compared to "climate deniers" is a shot below the belt. It's uncalled for and it all adds up. His resistance to becoming a scaremonger has nothing to do with the severity of climate change or protecting people. He just wants to protect his reputation and not feel fear himself. There is no double blind experiment in climate science. Fear is the appropriate logical reaction to climate change. Blunting that fear blunts the response to climate change. But no. People, including scientists don't want to feel fear. They rather prepare for a distant danger in the year 2100. Caveat: Fear without hope is as paralyzing as hope without fear. While the truth about climate change must be told to people and that truth is scary, a message of hope has to be delivered with it so that people has a means for action and don't fall into panic.